You are itching to break from routine and travel some place exciting, but are you holding back on travel plans due to budget constraints? Travel provides some of the best experiences and memories, however, the costs related to travel keep many from exploring. While there will always be new things to do within your city limits, an occasional journey outside to places lesser known is a must-experience. If budget is your only concern, India provides many destinations that are pocket friendly. South India constituting of the states Kerala, Tamil Nadu, Andhra Pradesh, Telangana and Karnataka, offers many places from hill stations to beaches, from wildlife getaways to city holidays. 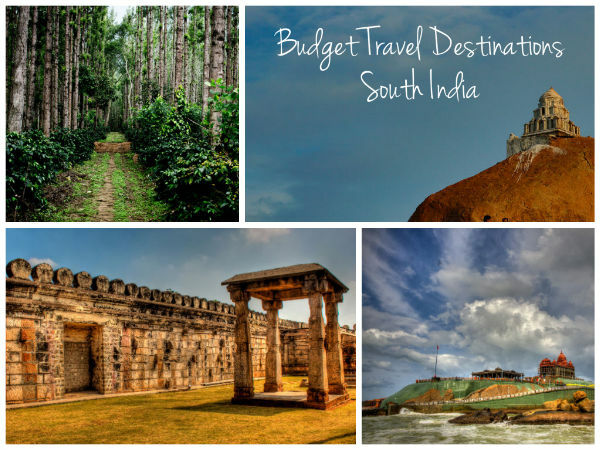 Here is a look at the ten travel destinations in South India that you can travel on a tight budget. The food, transport and accommodation at these destinations cost much lesser than the more popular tourist attractions. Despite the lesser costs these places have much to offer. So, don't hold yourself back, go forth and explore! Situated in the Western Ghats and known as a part of the beautiful Malanad, meaning land of rain in the local tongue, Chikmagalur is a beautiful getaway. The best part is that this exotic travel destination can be planned on a tight budget. There are plenty of state transport options within Karnataka to travel to Chikmagalur. The many coffee and pepper plantations here run home-stays on the property and offer rooms and dormitories at decent rates. Activities such as plantation walks, travel to viewpoints and food can also be included in the package. It is a great idea for an introspective solo journey or relaxed time with friends! The city of Srirangapatna has historical significance, briefly having been the capital of Mysore during the reign of Tipu Sultan. Today, the city located at a short distance of 20 km from Mysore is a destination waiting to be explored. The city has always held religious importance for its Ranganathaswamy Temple. Surrounded by river Cauvery, the city that looks like an island is also a great place to explore the scenic beauty of the region and visit wildlife hotspots such as Ranganathittu Bird Sanctuary. There are many budget stays available and transport via private and state transport can get you around the place easily. If you are looking for budget travel destinations in South India, why not consider visiting the tip of the country at Kanyakumari. The popular beach and temple destination has much to offer from scenic views, heritage tourism and ancient temples. Enjoy the delicious South Indian cuisine at the many restaurants here, travel with ease in Tamil Nadu's public transport and find a plethora of budget hotels to choose from. Watching the sunset over the the Thiruvalluvar Statue is among the best sights and does not require a penny to be enjoyed! Situated on the banks of river Tungabhadra, the fascinating ruins of Vijayanagara empire constitute the popular travel destination that is Hampi. The place attracts many travellers from across the world and has home-stays as well as budget hotels. The Tamil Nadu Tourism hotel also offers good deals on rooms. Food ranges from Indian to even exotic dishes that people may have a tough time spelling! Choose what you eat carefully, as some dishes are priced rather exorbitantly. The entry fee at the various monuments are minimum and the joy of drinking goli soda on a hot day is a pleasure few pennies can buy! You can travel to Hampi by bus, within Hampi you can hire a bike as it will work out to be much cheaper than autos. The gateway to many tourist attractions in South India, Pollachi has much to offer. The agricultural lands of Pollachi brim with greenery. On the highway to the city, you can observe many fruit vendors. Guava is among the fruits that are widely available and cost little to buy, so enjoy! Budget hotels and farm stays are available in the city and food both vegetarian and non-vegetarian can be ordered at decent rates. Travel to the city is easy as it is connected by national and state highways. You can drive down or choose from the many public transport options. To travel within the city, you can choose between bus, auto and cab facilities. Also referred to as Chettinad, Karaikudi is situated in Tamil Nadu. The town with a vivid history is also a hub for cultural and heritage tourism in the country. As with any other town in Tamil Nadu, Karaikudi too has its share of temples. But what attracts travellers are the many beautiful Chettinad mansions and palaces. Take a tour of these rich homes that are stellar examples of art, culture and architecture. Take a guided tour on the making of the Athanagudi tiles, a dying art form and of course eat to your heart's content! After all, Chettinad cuisine has won recognition the world over for its flavoursome cooking. The stay here can be managed well within budget. Kotagiri in Tamil Nadu is a popular hill station located in the Nilgiris. Smaller than the more famous destinations such as Ooty and Coonoor, the small hill station has plenty to offer travellers with a small budget. It is a great travel destination for friends travelling in groups, as there are activities such as trekking to keep you occupied. Enjoy the various nature trails that lead to waterfalls and viewpoints. Also soak in the beauty of the tea plantations. You can travel to Kotagiri by public transport, and find budget stays in the variety of hotels located here. Among the cheapest destinations to travel in South India is the stunning beauty of Wayanad. Situated in Kerala, this quaint place attracts many travellers and yet manages to stand pure and uncluttered. There are many things to do in Wayanad; explore options such as camping by the lake waters, walks through the bamboo forests of Kuruva Dweep or explore the Edalkkal caves at the nearby Sultan Bathery. Stay in camps are cheap and food is also available at decent rates. Transport includes public and private buses. Travelling within Wayanad is best done in bus or share autos. The beautiful coastal town of Varkala in Kerala is among the cheap places to travel in South India. While the place has expensive resort and houseboat options, it also has home-stays and budget hotels. You can explore the scenic beaches, waterways and springs that dot the region for free! Activities such as paragliding and para-sailing will be expensive and best avoided. Cultural shows at Varkala Kathakali Centre present an unforgettable experience. Food and transport can be managed on a tight budget. Among the prominent destinations in Andhra Pradesh is Vizag or Visakhapatnam. Among the budget travel destinations in the country, Vizag offers plenty to explore. Enjoy the scenic beaches of the city. In fact, the Government Tourism Hotel is located on the beach road and offers a variety of travel packages to nearby attractions such as Araku Valley at decent rates. Travel options to Vizag include both trains and buses.